When looking to buy a jet ski, there are only a few names worth trusting with such an important purchase. As a leader in the industry for decades, Kawasaki is a top choice for several reasons. From their commitment to innovation in design to their dependable elements of performance sure to excite with every ride, they continue to set a high industry standard. Let our Kawasaki watercraft buying guide break down a few important aspects to make this an easy purchase! The first question you should ask yourself when buying a Kawasaki jet ski is whether you want a stand-up or sit-down model. A stand-up jet ski is one where the rider rides in a standing position the entire time. These are usually faster and meant for those with a need for speed. A sit-down model still offers reliable speed but with more comfort while riding and an added stability a standing model lacks. A sit-down design is the more common option since it allows you to ride while seated and offers the option of additional riders. A standing jet ski is only for one rider so if you are looking for an option for the family to enjoy, a standing jet ski probably isn't for you. Once you know whether you want a stand-up or sit-down model, the next most important thing in our Kawasaki watercraft buying guide is to figure out how many riders. If you know how many riders you intend to have on the watercraft at once, it will narrow down the available choices from this manufacturer so you can get the right outcome. While the newer models of jet ski from Kawasaki are all either standing single passenger rides or their massive 3-seaters, you can still find two-seater options if you are shopping a used selection. A jet ski can be a lot of fun for the entire family so many people choose the 3-seater option. Even if you aren't sure you will ride with two other people, the 3-seaters usually offer better stability and control than the single rider or two-seater option. Once you know how many riders you expect to haul from time to time, you can start looking at the models Kawasaki has to offer for personal watercraft. 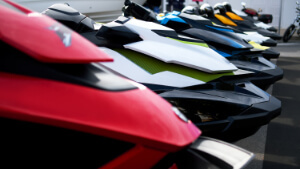 If you are shopping for a used jet ski, you will find a range of options wholly dependent on what others are selling at the moment. When looking for a new jet ski, the latest Kawasaki family is made up of the SX-R single rider, standing jet ski, the 3 passenger STX, and the Ultra LX. These models all offer similar performance elements with the main difference between them being the seating arrangement and a few smaller details. For instance, all three models all feature 4-stroke engines with displacements of 1,498cc, inducted water cooling systems, thrust of 957 pounds, 3 blade stainless steel impellors, and other elements. When looking for a new Kawasaki model to break out of the pack, their Supercharged Ultra 310 lineup is what you need. With a supercharged and cooled engine with air-to-water intercooler, 160mm jet pump, and electronic throttle valves, these jet skis are made for speed and power on the water. Best of all, you can choose between different options in this model range including their racing editions and luxury editions.